In episode 50 Patrick Watson joins the show to talk about his list of 10 unique problems that only astrologers have. Some of the problems represent real issues regarding the perception of astrology in modern society, while others that are just humorous annoyances that astrology enthusiasts have to deal with from time to time. 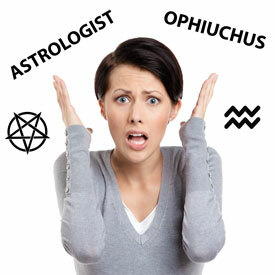 The list is based on a recent article on Patrick’s blog titled Top 10 Problems Astrologers Have That Are Just the Worst. Below you will find a synopsis of some of the points that we covered during the course of the episode, followed by links to download or listen to this episode of the podcast. We talk about these and related themes during the course of the show. Bravo Patrick you voiced one of our greatest pet peeves–using “conjunct” or “conjuncts” as a verb instead of the correct “conjoin” or “conjoins.” As the editor of books and NCGR memberletter, I correct this all the time, and my husband Ken Irving who has edited astrology magazines and books for many years also cringes. I am afraid with more and more people self-editing there may not be a quick fix. Enjoyed the rest of the show as well. I think part of the confusion regarding terminology is inconsistency of use; a condition or state of the planet by aspect (the adjective) is often made into an action (verb) and this is acceptable for some situations but not others you seem to be saying. For example, let’s use Venus square Saturn in a chart: Venus is square or in square (by condition) to Saturn and vice versa, and she is also said to be squaring Saturn (by the action of the aspect). Or is this wrong? Likewise, she may be opposing (action) or in opposition to, trining (action) or trine, and conjuncting (action), making a conjunction, or conjunct. In this example we would have to throw all the verb use, or make conjunct the anomaly and say she is conjoining – which will never happen in real use, I am sure. Where by the way is the rule book? To add to the confusion we have the inconjunct aka quincunx. I use adjectives, not verbs, but I wonder – who makes this decision? Secondly, why change the name of the signs in Tropical vs Sidereal? Yes the sign names represent the constellation but the original meaning of the constellation was assigned archetypal characteristics because of the time of year, and those same characteristics still apply at certain times of the year relative to the equinoxes and that was the point to begin with. The seasons and our organic resonance with them are what determine the characteristic, not the “energy” pattern of the constellation. right? Also, many first decan degrees still carry the stars of the previous sign, and the influence from position by degree in the triplicity brings in yet another constellation, so who cares? Nice discussion once again – and there is so much more to say…. One of the reasons why Patrick or whoever proposed giving the tropical and sidereal zodiacal signs different names is to help differentiate them, under the premise that both are true but just in different ways somehow. This is a bit problematic though because astrologers often use them in essentially the exact same ways and attribute them the same qualities, but they just happen to represent positions on the ecliptic that are almost 30 degrees off from one another now. So, first someone would have to establish what each zodiac does or relates to that is different than the other, and then they would have to come up with different names in order to make it clear that there is a separate application for each, and astrologers are not just confusing them on accident or something. (of a planet) be in a trine aspect with (another planet or position): "Jupiter trines Pluto all month"
I believe it was around the free will part. The two primary sources are Valens and Ptolemy. For Ptolemy it should be in book 1, chapter 3 as part of his partial justification for doing astrology. For Valens it is in an extended philosophical digression in book 5. Message me again in a week or two and I can give you more precise references if you want. Getting ready to leave for a trip right now. PLEASE do a show about the different zodiacs. I think this confusion is one of the main reasons astrology remains questionable. There seems to me to be a belief among the Sidereal astrologers that the constellation itself had an influence, that there is a causal influence from the fixed stars themselves on the natal chart, and the time of year (the equinoxes) are irrelevant. If not, why else would any one care if you preferred to use the Tropical Zodiac? So this becomes a bigger issue – one of causality and the defining of the mechanism by which astrology works. Where is the empirical evidence? I think having someone on the show who uses both systems would be very helpful. And what about predictions made from both systems? How reliable have they been? One of the issues that I’m having trouble balancing as I put together that show is on the one hand my desire to showcase and discuss different approaches within the astrological community, and then on the other hand my desire to give the specific arguments and reasons for promoting the approach that I personally think works best. So, this is something I’m still trying to figure out how to do in an appropriate fashion with that episode. How about two shows then? I would love to just hear the two systems explained in a way that shows why they are both valid, and how the characteristics of the zodiac sign became established and how that influence can be true for both systems if the constellations are no longer in sync with the Tropical zodiac the way they were originally. Which system of mythology do we use and why? Do the mythologies overlap? And what happens if you live in Bali and there is equal day and night year round? Why would the equinoxes still matter if the seasons have no relevance? How about evidence? Isn’t accuracy of prediction a sort of test as to the efficacy of the respective systems? I think you could make two shows out of this easily. I have been working on this question a little bit. IMHO, it seems obvious that the sun path originated the zodiac (and not the fixed stars). I mean, a long time ago, maybe when the agriculture was born, even we have no records of this anymore. The balance between day and night. The justice of the Sun. Hard to argue with that. When a scorpion stings you, your wound looks like lips : the kiss of the Scorpion. When you see this, you know you will die soon. That’s (maybe) why we have the symbolism of Scorpio in November, because our Sun receives the kiss of the Scorpion, meaning the Sun will soon be dead. And it’s true as the Sun is moving toward the winter solstice. This Mafia ritual – kissing you before killing you – is just that too. The Sun is hurt again as he receives an arrow from the Sagittarius. The rise of the (new) Sun. The goat that climbs the mountain. I like the ending scene of the Lion King as the movie just shows that : the Sun climbs the mountain to show he is alive and he is the true king. The Sun moving like a crab after the summer solstice. The lion, the most solar animal. The Sun kingdom (king-domicile). It’s hard for me to conceive a Lion born in Winter (that will happen one day with the sidereal zodiac). Or a Scorpion born in Spring. That makes no sense. The Sun is our main star, let’s not forget that. Our reality is the Sun and his light. The life is a succession of days, months, seasons and years. Precession of the equinox is a much slower cycle, that seems more of a civilization cycle : the ages. I may sound a bit opinionated, but I’m kind of tired of this sidereal zodiac that brings so much confusion and that even professional astrologers don’t know how to respond to. And I should have talked about Virgo too : harvest and the seeds of life to survive through winter. Virgo is just that : the task to preserve summer life through winter. It’s a lot of organization and serious work. I remember reading once this idea that we don’t live ON a sphere, but IN a sphere (the solar system). In this world, the Sun and the Moon are the King and the Queen. They are the most important celestial objects for us. They rule Summer : Cancer and Leo. Opposed to these two are Capricorn and Aquarius, both ruled by Saturn. I see Saturn as the Dark Lord (he is far from the Sun and he wears a crown – the rings). He rules Winter, so he is not caring and loving, but Saturn will teach you wisdom and knowledge (will you survive winter or not ?) That’s astrology 101, but astrologers often go to crazy techniques (like mid-points, asteroids, Regulus or Antares and so) instead of mastering the basics. I feel that sidereal zodiac is a bit like that. Not seeing what the zodiac is really all about : the sun path ; the seasons ; cardinal fire (Aries) -> fixed fire (Leo) -> mutable fire (Sagittarius) -> no fire in winter. Precession of equinox seems to me as a big slower clock that is not related to the daily human life on Earth. That’s my line – maybe I’m wrong – but as you say : it’s time to truly understand the symbolic of these systems and not just use them as technical tools. And I find your idea very interesting : “toward a more agnostic perspective and out of the Judeo Christian paradigm”. Mmaybe astrology has a big role to play in this coming world ? I’m back with great stuff (today is the full moon). A solar year. Twelve lunar months. That’s the root of our Zodiac. Thanks for being substantive and entertaining at the same time!